The 2018 Honda Accord has the style, performance, and technology to make it a universal success. The Honda Accord is one of the most popular cars ever built, with annual sales figures that dwarf entire car companies (not small ones, we might add). Honda’s breadwinner enables the company to build things like the wing-tastic Civic Type R – and sell it for less than rival hot hatchbacks. Even as SUVs grow in popularity, most consumers still gauge the Honda brand by the Accord’s styling and substance. It is a car with a blemish-free history and near-universal appeal. Now Honda’s gone and changed it. With so much enthusiasm for the current model, one might assume Honda would alter little. Instead, the 10th-generation Accord introduces all new styling, technology, driving dynamics, powertrains, and more. 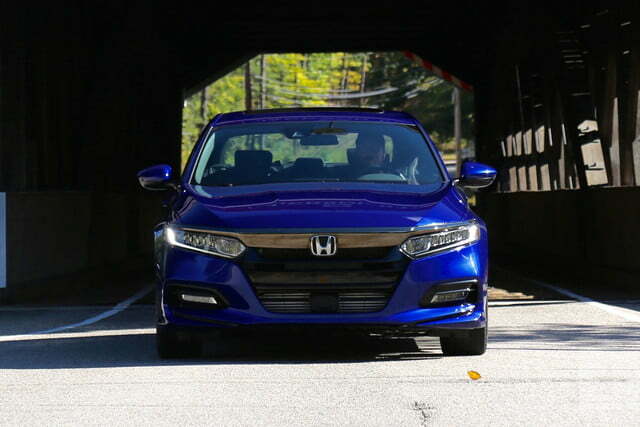 Our first drive left us with a positive impression; now it’s time to become more acquainted with Honda’s midsize sedan. 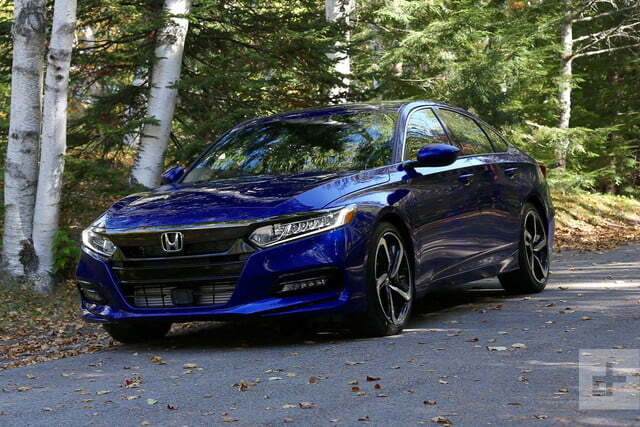 Read on for our 2018 Honda Accord Sport Review. Exterior design is a touchy thing within the midsize sedan segment. For many years, conservative styling was the way to go – just look at the Toyota Camry. These days, consumers want intrigue. That’s good news for brands like Mazda and its 6 sedan, which has been ahead of the curve in terms of allure. For Toyota, this shift has forced the safe-bet automaker to go bold with its latest Camry (some might argue a bit too bold). The Hyundai Sonata, another of the Accord’s main rivals, splits the difference with a sharp but restrained exterior. 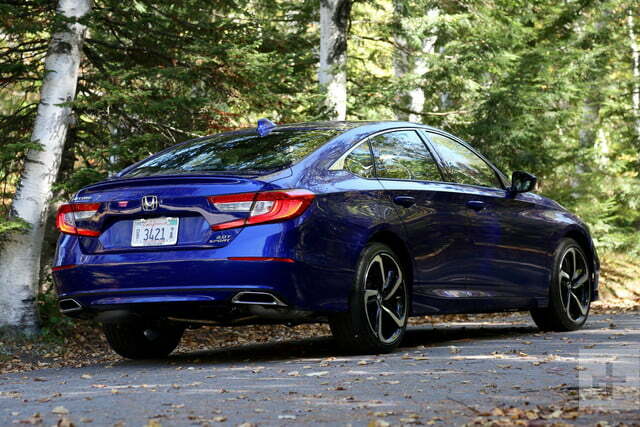 The all-new Accord is designed with Camry-like daring, though Honda’s designers appear more in control of their flourishes. A low, stretched front end, coupe-inspired roofline, prominent 19-inch alloy wheels, and C-shaped LED taillights offer plenty of eye candy without overindulging. 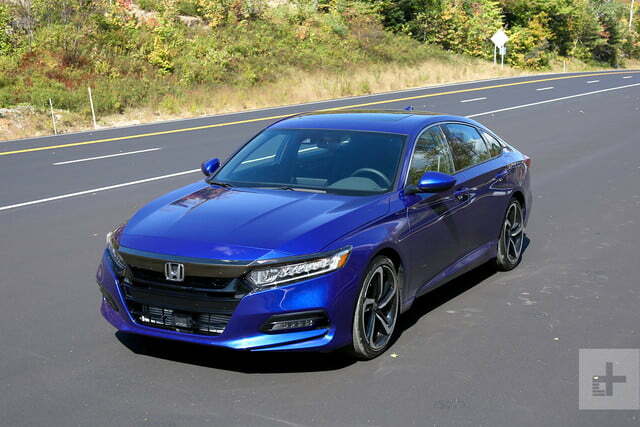 The all-new Accord is designed with Camry-like daring, though Honda’s designers appear more in control of their flourishes. 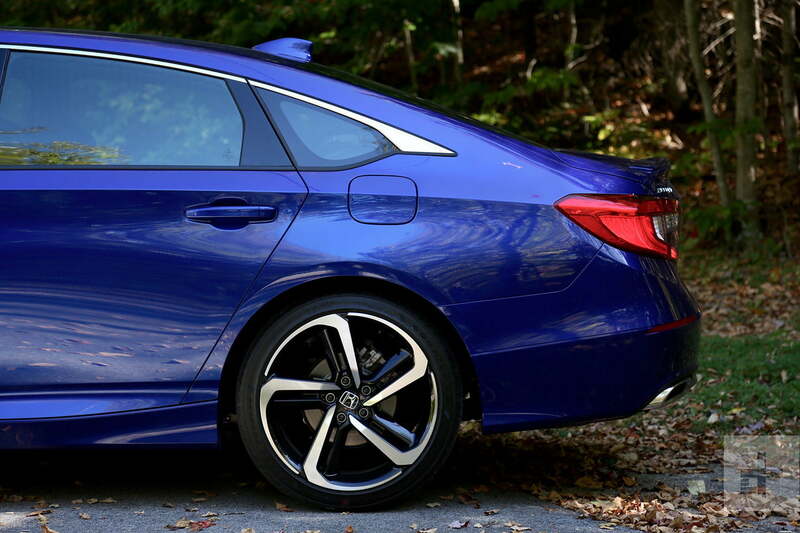 Some will still prefer the more angular aesthetic of the current generation, but importantly, the exterior tweaks maintain the Accord’s upscale physique. The 2018 Honda Accord is offered in five trim levels: LX, Sport, EX, EX-L, and Touring. Standard on the entry-level LX model ($23,570) is Honda Sensing driver aids, push-button ignition, dual-zone climate control, a multi-angle rearview camera, 17-inch alloy wheels, LED headlights, a 7-inch TFT display, Bluetooth and USB audio, automatic high beams, and daytime running lights (DRLs). Sport 1.5L models ($25,780) add Apple CarPlay, Android Auto, 12-way power drivers seat, 19-inch alloy wheels, LED fog lights, leather-wrapped steering wheel, 8.0-inch touchscreen, 8-speaker sound system, chrome exhaust, and a rear spoiler. Our 2.0L Sport tester checks in at $31,200 (including $890 in destination and handling fees). 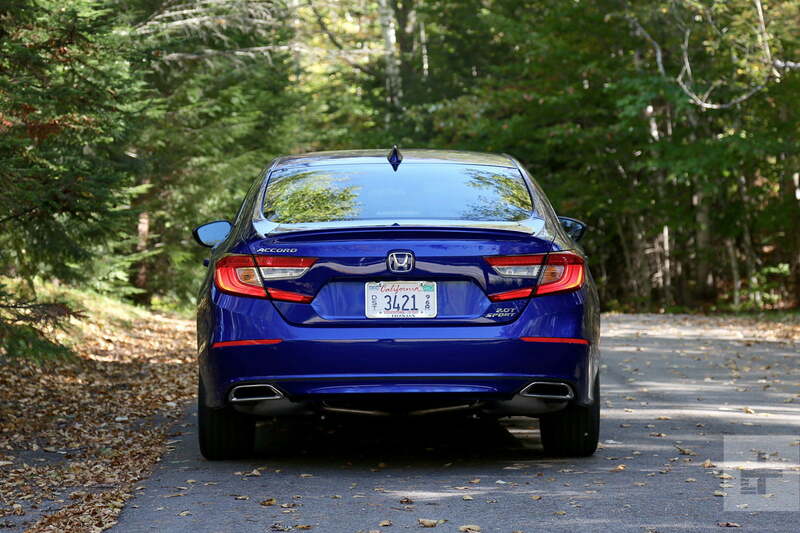 One of the biggest highlights of the all-new Accord is Honda’s suite of active safety features (Honda Sensing). Now standard on every trim level, this robust set of driver aids makes for a safer commute for everyone – not just Accord passengers. Standard goodies include a multi-angle backup camera, forward collision mitigation braking, road departure mitigation, adaptive cruise control with low-speed follow, lane keeping assist, and traffic sign recognition. 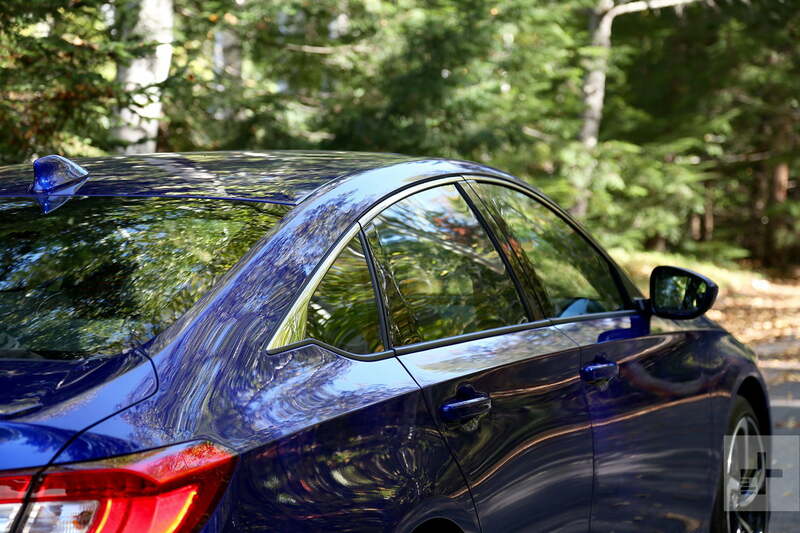 At the EX trim level, Honda adds blind spot monitoring and rear cross traffic alerts. At the top of the range, Accord Touring models include front and rear parking sensors and a color head-up display. Honda was among the first mainstream automakers to test and apply these driver aids to its vehicles, and while they may not be as sophisticated as some luxury brands like Mercedes-Benz and BMW, important features like emergency braking and adaptive cruise control work perfectly. Toyota also includes its PreSense active safety kit on every Camry, but Hyundai only offers its full suite in Limited trims. 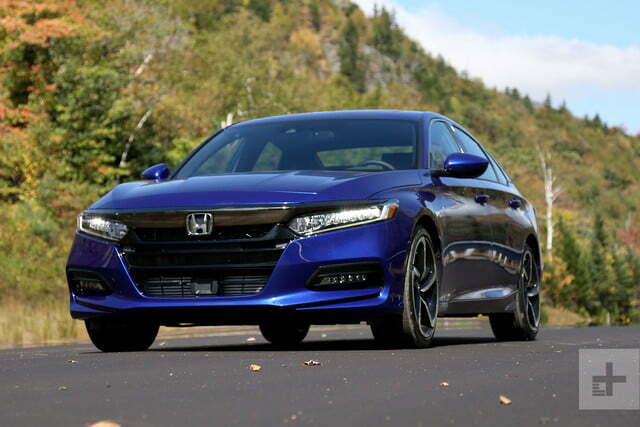 The inclusion of Honda Sensing on every Accord is a big selling point, but perhaps not as much as the automaker’s all-new infotainment system. Replacing HondaLink — a touchscreen exclusive, unintuitive, unresponsive module — is Honda’s latest 8.0-inch Display Audio (a 7.0-inch system is standard). The new system harmonizes physical controls for common settings like “home,” song selection, and volume, with touch controls within the screen itself. The layout is infinitely better, but that’s not all; menu structure, screen resolution, and processing are all improved. Apple CarPlay and Android Auto are at the ready in Sport and above trims, but even LX grades now have a pleasantly functional interface. Compared to Toyota’s Entune 3.0 system, which lacks Apple CarPlay and Android Auto in any configuration, Honda’s latest infotainment has a clear advantage. Hyundai’s Blue Link is wonderfully simply to use, but lacks some of Honda’s more robust features. 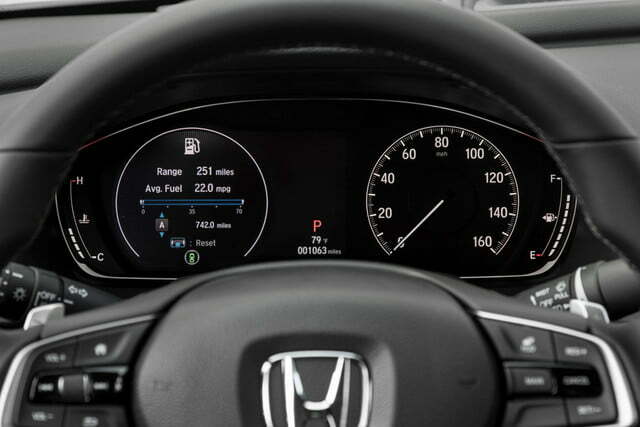 Honda also includes a reconfigurable 7.0-inch TFT display in place of an analog tachometer – something none of its competitors offer. Honda’s all-new infotainment system harmonizes physical and touch controls in one intuitive display in the 2018 Accord. High-end tech is great, but it won’t cradle your bottom on a long drive. Fortunately, the 2018 Accord has conventional comfort to match its advanced gadgets. Accord Sport models feature cushy fabric seats with leather-like side and seatback trim that are designed for enduring relaxation. With an additional 1.9-inches of rear legroom and 0.9 cu. 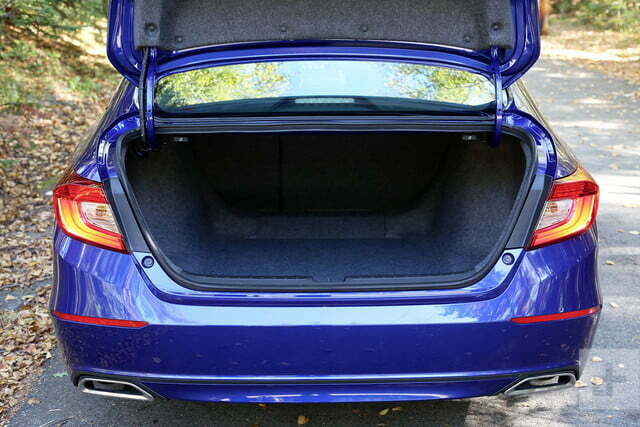 ft. of extra cargo capacity (for totals of 40.4-inches and 16.7 cu. ft., respectively), backseat riders have ample space. 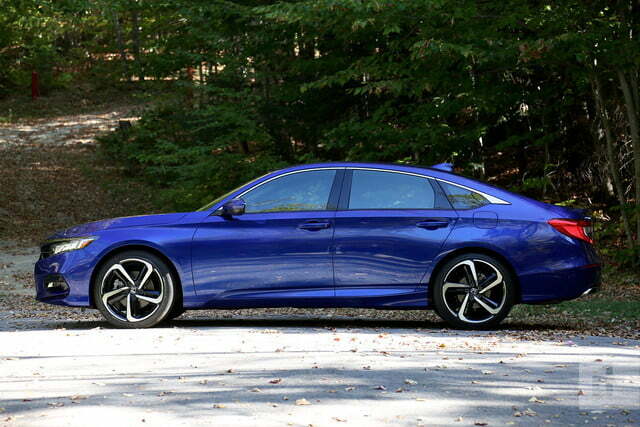 Riders with tall torsos may feel their craniums touching the roof, thanks to the Accord’s fastback silhouette, but only giants will experience a truly tight squeeze. The Accord’s redesigned cabin is, above all, more premium than ever before. Save for the minor blemish of some cheap looking trim panels in Sport models, every touch point and accent – from the knurled metal climate control knobs, to the high quality textured plastics, to the elegant silver finishes – feels exclusive. 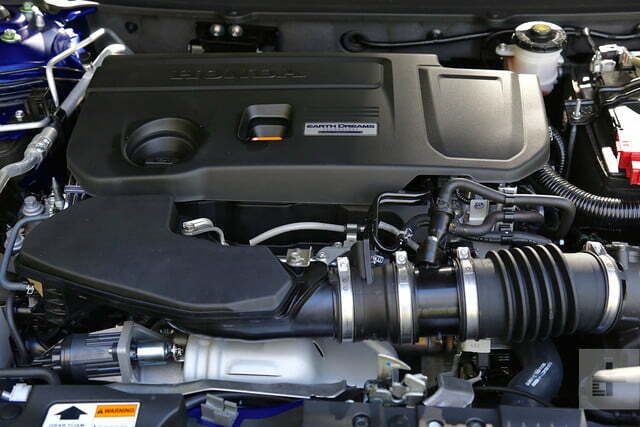 You can choose any engine for the 2018 Honda Accord, as long as it’s a turbocharged four-cylinder. Sorry for the tired joke, but Honda’s condensed powertrain range should be appraised lightheartedly. The base motor, a 1.5-liter turbo four-cylinder, makes a healthy 192 horsepower and 192 pound-feet of torque, but it’s the uprated 2.0-liter unit you want. 252 hp and 273 lb-ft of torque may not sound like a ton, but the low-end torque delivery means the Accord 2.0 can hit 60 mph in under 5.9 seconds (according to Car and Driver) – when equipped with the optional 10-speed automatic. Manual-equipped cars lose two tenths of a second in their sprints. The spiciest Camry, the XSE V6, makes 49 more ponies and six fewer lb-ft of torque than the Accord 2.0. This power advantage would give the Camry a performance edge, but its nearly 300 pounds of extra weight mean it’s actually 0.1 second slower to 60 mph in independent tests. If you really want a power-hungry four-door, you can get the Ford Fusion Sport with 325 hp and 350 lb-ft of torque. The 2018 Mazda6 should also be a hoot with the CX-9’s 2.5-liter turbo four-cylinder good for 250 hp and 310 lb-ft of torque. 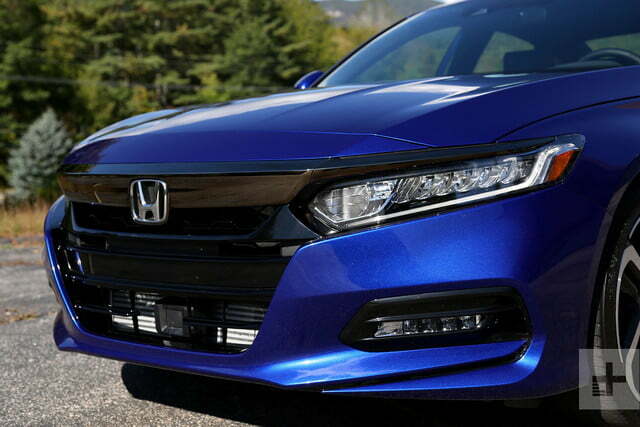 At learning that the new Accord wouldn’t be offered with a V6, some Honda fans cried foul. We’re here to assure those folks that they have nothing to fear. Small displacement four-cylinders are common among every major luxury marque. The BMW 330i, Audi A4, Mercedes-Benz C300, and a number of other premium sedans use these motors with potent results; the new Accord is much the same. 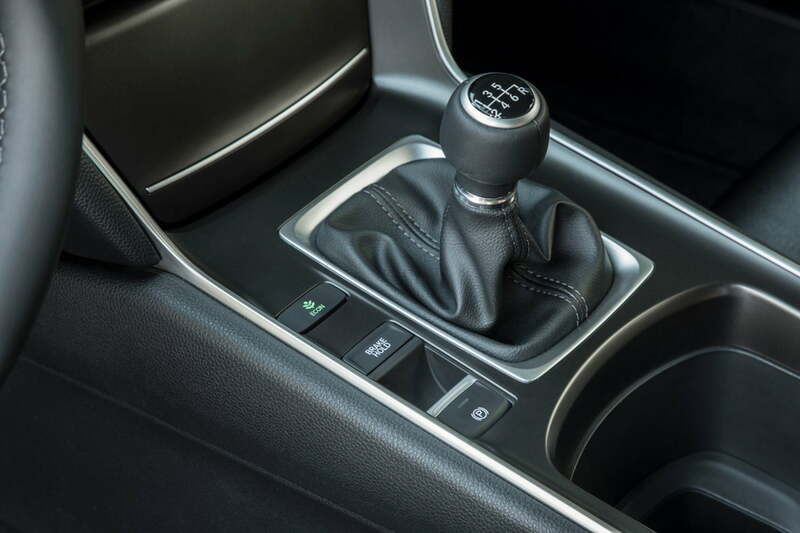 With robust internals, the 2018 Accord’s stellar six-speed transmission is a nod to enthusiasts with tuning aspirations.. Complementing Honda’s 2.0-liter mill is a Civic Type R-derived six-speed manual gearbox. Fluid, with short throws and clear gear engagement, the Accord’s gearbox is a treat to operate. With robust internals, we see Honda’s stellar transmission (and forced induction engines) as a nod to enthusiasts who have tuning aspirations. We know this manual is built to handle over 300 horsepower, so why not bolt on some parts? 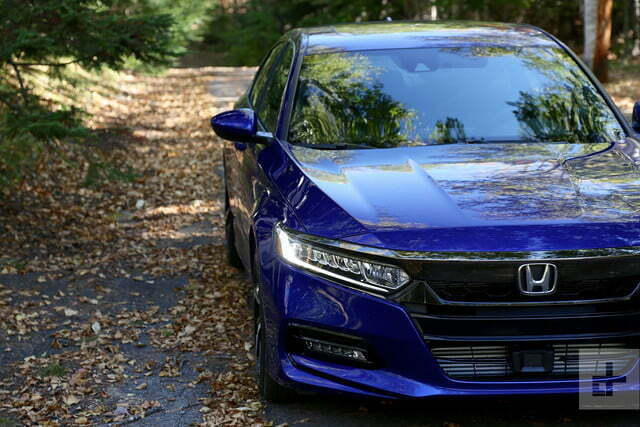 With proper ECU tuning, higher performance headers, intake, and exhaust could transform the Accord Sport into even more of a sleeper than it already is. Lateral agility is another of the new Accord’s strengths. Light and responsive, the sedan loves corners as much as it enjoys chirping its tires between gears. 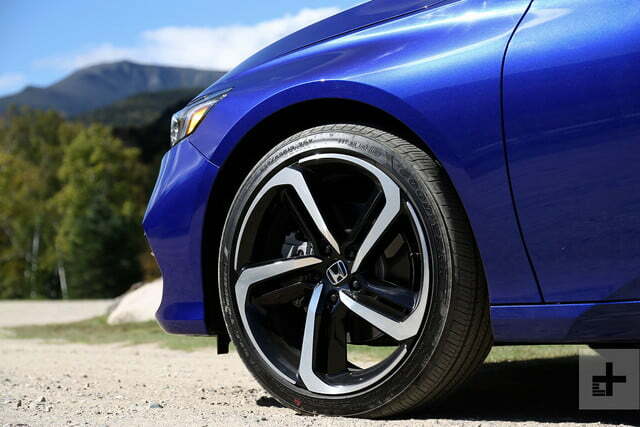 While not as razor sharp as a luxury sport sedan, the Accord stays flat under corner load and doesn’t plough nearly as much as other front-drive four-doors. With the coupe body style and V6 engine no longer on offer, this is the sportiest Accord you can buy. 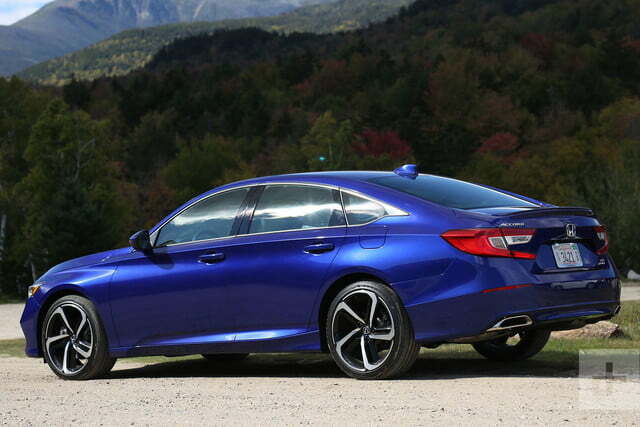 Thankfully, we also think this is the sportiest Accord ever made. Fuel economy for the 2.0 Sport is right on par with rivals at 22 city, 32 highway, and 26 combined mpg. The V6-powered Camry, miraculously, manages an extra mpg on the highway. Hyundai’s Sonata 2.0, meanwhile, scores an extra mpg in the city compared to the Camry and Accord. During our time with the 2018 Accord Sport, we averaged a slightly better than quoted 27 mpg. Honda’s reputation is one of rock-solid reliability. While the company offers a three-year, 36,000-mile vehicle warranty (and five-year, 60,000-mile powertrain warranty), it’s more than likely you’ll blow past the warranty period and far into the future without experiencing any issues with your Accord sedan. 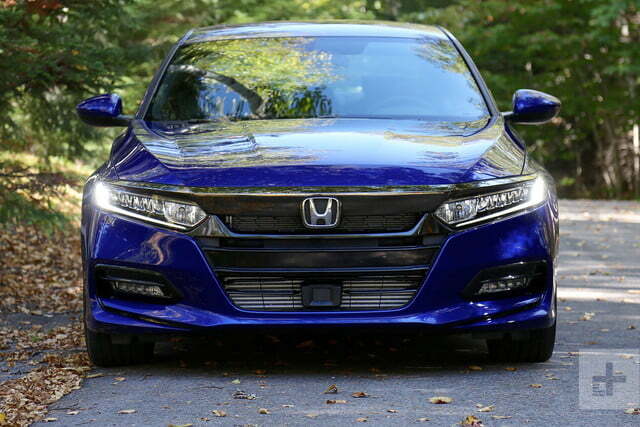 Honda does an admirable job of equipping its low and mid-grade models with headlining technology, making our ideal Accord relatively affordable. In fact, we’d option an Accord much like our test car. Start with the Sport trim level, 2.0-liter turbocharged engine, and six-speed manual transmission. From there, add the San Marino red paint and wireless phone charger ($300). Our final price of $31,500 represents one heck of a feature-rich bargain. It takes a hypercritical eye to pick out the 2018 Honda Accord’s flaws, and that’s what makes it one of the best cars we’ve driven this year. In every aspect — performance, styling, technology, comfort, and efficiency — the Accord is class-leading. With most of the vehicles we review, it takes a while to adjust into a car’s features or design, but the Accord is an instant, tailor-made fit. YES. Within the midsize bracket, there are subjectively more attractive vehicles (the Mazda6) and objectively faster models (the Ford Fusion), but we see these as special interest models compared to the Accord. A case can be made for one of the Accord’s competitors, but only to those seeking a particular character trait of their four-door – not to the vast majority of midsize shoppers. It’s no wonder Honda sells so many of these sedans; there’s something for everyone.